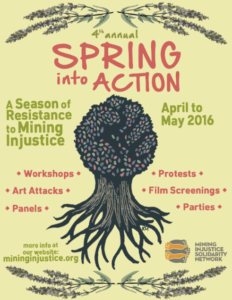 Every year, as Canadian mining companies hold their shareholder meetings here in Toronto, we Spring into Action with protests, street theatre, art attacks, films screenings, workshops (and more!) to educate, advocate, and agitate in solidarity with communities around the world impacted by the harmful effects of these mining projects. Protest Barrick! Stand with Communities Demanding Justice: On April 26 at 11am, people gathered outside of Barrick Gold’s annual general meeting to protest that company for the 10th year in a row. The rally outside supported statements being read inside Barrick’s meeting. This year, the protest and statements highlighted abuses at Barrick’s mines in Argentina, Papua New Guinea, Dominican Republic and Tanzania. Art Attack in Response to Tahoe Resources: On May 3rd we hit the streets of Yorkville. The next morning, over four hundred ‘wanted’ posters were found affixed to walls, posts, and newspaper boxes greeted Tahoe Resources shareholders on their way into the mining company’s 2016 shareholder meeting this morning. The posters highlight charges against various Tahoe employees, ranging from ordering the shooting of residents to industrial contamination, as well as human rights and environmental abuses alleged by communities surrounding Tahoe’s flagship mine in Guatemala. Identical posters were also plastered across downtown Vancouver and Reno, the locations of Tahoe Resources’ Canadian and American headquarters. Connecting Anti-Colonial Struggles: River Run Panel featuring Judy Da Silva: On May 14th MISN co-organized a panel featuringJudy Da Silva of Grassy Narrows and speakers from No One Is Illegal (Toronto). This panel connected Grassy Narrows’ fight for justice with migrant justice and the violence of Canadian settler colonialism and imperialism. New Hudbay Minerals Documentary! Film Premiere + Q&A with the Director: On May 24th MISN co-hosted the premiere of a brand new film telling the stories of the communities resisting Hudbay Minerals in Guatemala, Peru, northern Manitoba, and Arizona. The film’s director, John Dougherty, answered questions after the screening, and MISN provided audience members with an opportunity to take action in solidarity with the communities depicted in the film.